KINDA SPOILER-ISH ALERT: There are some elements from The Infinite Sea that I’ll have to talk about in order to write any sort of review. I’ll try not to go into a tremendous amount of detail, but if you prefer to know nothing about what happens, well, here’s another good time to look away. In The 5th Wave, the subject matter is nothing less than the destruction of the human race at the hands of alien invaders. Over the course of an apocalyptic few months, 98% of Earth’s population has been killed in all sort of horrifying ways. The story focuses on a handful of survivors, each on their own, trying not only to stay alive themselves, but to save or sustain the people they love. What else? Well, that’s mostly it. In The 5th Wave, our main three point of view characters are Cassie, Ben, and Evan. Each has his or her own intense story to tell, with a unique viewpoint on the events unfolding. In The Infinite Sea, the perspective expands to include chapters narrated by several other characters. Does this help broaden the view of life after the invasion? Not really. It’s not that I wasn’t interested in what happened in The Infinite Sea. I was. But at the same time, the story somehow feels narrow, almost claustrophobic. Part of what really impressed me in The 5th Wave was the epic scale. As seen through the eyes of our POV characters, the destruction is devastatingly huge, yet also intimate in that the impact of the invasion is highly personal. Family members die cruel, bloody deaths. Trusted adults betray in horrible, mind-breaking, soul-damaging ways. Safe havens turn out to be hell on earth. Humans yearn for companionship, but safety lies only in isolation. The loss each character experiences, especially Cassie, is enormous not just for the character, but because of what it means for the entirety of human life. Compared to all that, The Infinite Sea feels small. In a most literal sense, it is: Going by my physical copies of both books, The Infinite Sea is about 150 pages shorter than The 5th Wave. The invasion is still underway, but not much has changed. We spend all of this second book holed up with our group of characters, waiting for the next awful thing to happen. The relationships barely move forward, and they have very little to do other than hide and speculate – and talk and talk and talk. The endless talk is yet another piece that works less well for me in The Infinite Sea. In The 5th Wave, the language is often highly dramatic, much more figurative than you might expect out of the mouths of teens dealing with disaster, but somehow it matches the grand tone of the entire book. Sadly, in The Infinite Sea, the language tends toward an overuse of imagery and metaphor, and rather than feeling epic, it ends up sounding like borderline mumbo-jumbo. I understood. In the safe room, a billion upraised faces populating the infinite, and the eyes that sough mine, and the question in those eyes too horrible to put into words, Will I live? It’s all connected. The Others understood that, understood it better than most of us. No hope without faith, no faith without hope, no love without trust, no trust, without love. Remove one and the entire human house of cards collapses. It’s all about a search for meaning in disaster, but the discussions go in circle upon circle: There are rats in the walls. Are we the rats? Is the Earth the inhabited house the aliens want to move into? Why not kill all the rats? Why leave some rats alive? There’s the rock problem: Why not just use a big rock (i.e., a meteor) to wipe out all life? Why embed aliens inside the humans? Why play all the mind games? Why, why, why… this books amounts to a never-ending litany of characters discussing “why” — but unfortunately, we end with little more understanding than we had at the beginning of the book. Another problem: In what felt like a baffling shift to me, the entire second half of the book is focused on Ringer, a character in a supporting role in The 5th Wave. We barely know her; we never saw her point of view in the first book. An awful lot of space is devoted to Ringer’s experience, trapped and cut off from the other characters, and it’s a weird shift in emphasis. Cassie was established in The 5th Wave as our primary character, yet she and the rest of her entourage are absent for almost half of this book. Ringer’s story adds some knowledge to the mix, but it’s kind of jarring to have the book split like this, with two stories that don’t fit together. The Infinite Sea is clearly the bridge book in this trilogy. We need to get from the introduction of the disaster in The 5th Wave to the final resolution in the 3rd, yet-to-be-published book, but other than as a connection from point A to point B, The Infinite Sea adds very little to the world-building or the story arc of the series. By the end of this second book, I would have expected to understand much more about the reasons for the invasion and the strategies employed by the invaders. Instead, the only real progress is that the characters are beginning to understand that there’s a lot that they don’t know, that there has to be more to what to the invaders want, and that there are major pieces of the strategy that remain to be figured out. The more I write about The Infinite Sea, the more I realize how unsatisfying I found it. With very little story progression or character growth and very little in the way of unraveling the mysteries of the alien plan, it’s very difficult to point out much that’s gained by reading The Infinite Sea, other than a reshuffling of the chessboard and a set-up for a finale. Perhaps this series should have been two power-house books instead of a trilogy with a tepid middle. I’m hoping that the final book, supposedly to be released in September, will blow the story out of the water. The 5th Wave was amazing. I suppose if you want to find out what happens next, you have to read The Infinite Sea. But unless something is revealed early on in book #3 that demonstrates how the events of #2 matter, I’d say that The Infinite Sea is a mostly unimportant interlude that comes nowhere near to matching the power and scale of The 5th Wave. Proceed with caution — or perhaps wait until the release of the 3rd book and read it as an introduction to #3. 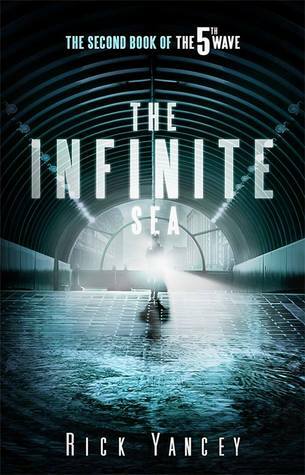 Read on its own, as the eagerly anticipated sequel to a fantastic first book, The Infinite Sea disappoints. Pretty spot on with how I felt as well. Flourish writing can only take plotless writing so far, and so I’m still scratching my head wondering what was so game changing-ly amazing about this book. I honestly believe if someone told me this was a novella, I would have enjoyed it far more (because it is an interlude, as you suggest). And while I did enjoy Ringer’s addition to the POV, the addition of Razor and Grace doesn’t really change anything going into the third novel. If anything, I was kinda bummed that a Vosch POV wasn’t incorporated–I feel like that would have opened up so much more (though I understand why its not wise to do so…sort of). You’re right, it would make more sense as a novella! I often feel like there’s too much emphasis in YA publishing on trilogies. Not every story needs to be told in three parts! It’ll be interesting to see how the 3rd book turns out and whether there’s something from The Infinite Sea that will really matter in the long run. I understand where you’re coming from. The Infinite Sea didn’t seem to make as much progress as The Fifth Wave did but for me I found it instigated some thought about why the aliens are actually here, I feel like it focused more on the reason and the psychology behind why the aliens are here rather than them destroying everyone or Cassie and stuff fighting them (if that makes sense?). I’m just a big fan of metaphors as it is so I personally found the book quite satisfying. I agree that raising the question of what the aliens actually were trying to accomplish was the key point of the book — but it just didn’t feel like an actual novel to me. I guess that’s the challenge for a lot of middle books in trilogies, finding the balance between keeping the story going vs not revealing too much or getting too close to the end. You’ve put it very nicely there. I feel like there are a LOT of questions now that need to be answered in the third book.